Native to South America, poison dart frogs exhibit brilliant colors to help ward off predators. In the wild, these frogs secrete a powerful toxin through their skin, although most that are bred in captivity aren't fed a diet that allows them to retain their poisonous abilities, leaving most of them full of color but not toxins. Caring for them at home starts with creating a tropical environment. Poison dart frogs are small, so they don't need a bunch of room. A 10-gallon aquarium tank makes an ideal housing environment for one to two frogs, for example. Younger frogs might feel more comfortable in an enclosed environment rather than a glass aquarium open on all sides; taping paper to three sides of your tank can help them acclimate. Add a few inches of sterile potting soil to the bottom of the tank, or use small aquarium gravel and sphagnum moss. Decorate with natural elements such as rocks and pesticide-free leaves. 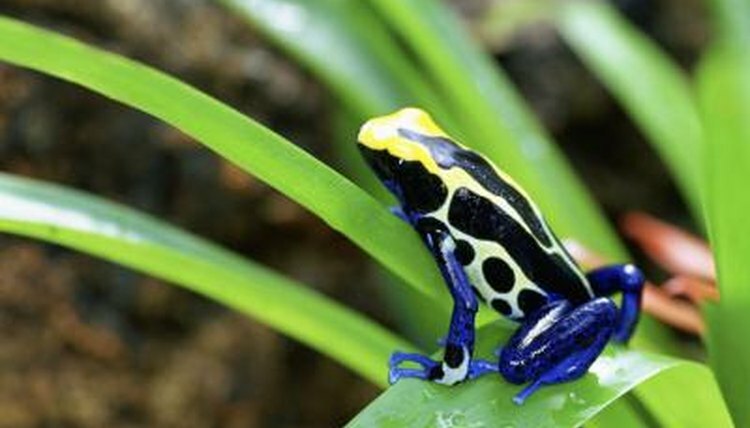 Poison dart frogs do best in temperatures of 72 to 82 degrees Fahrenheit. If the temperature drops to around 70 degrees at night, the frogs should still be fine, but if it rises to 85 degrees or higher they might die. A heat lamp might dry the air out inside the tank, so use reptile heating pads around the outside of the glass if necessary to keep the interior at the proper temperature. Poison dart frogs need tons of humidity—from 70 to 100 percent. Keep the tank lid tightly closed to hold the humid air in. These frogs don't need a constant flow of fresh air, and they'll get enough when you open the tank for feeding or spritzing. Spritz the walls every day, twice a day if necessary, to keep the humidity high. Adding some small plants helps maintain humidity as well and keeps the air clean for the frogs. Insects make up all of a dart frog's diet, and it's simple to provide what your frogs need. Flightless fruit flies and pinhead crickets—a small variety—often can be found at reptile supply stores or online and are commonly fed to poison dart frogs. Feed adults about every other day, giving them 40 to 50 fruit flies or pinhead crickets if the frogs are average in size; larger frogs might need more at a feeding. Younger frogs need to eat every day, but smaller amounts, 20 to 30 insects. Sprinkle a powdered vitamin supplement over the insects before dropping them in the tank to ensure your frogs get the right nutrition. Captive dart frogs rarely secrete poisons through their skin, but always use caution when handling your frogs. Because they are small and have delicate skin, don't handle them unless you have to, such as when you're moving them to a bigger tank. Cup them gently in your hands briefly when you must handle them, and wash your hands immediately afterward just in case small amounts of toxin are present. Any residual toxins shouldn't be strong enough to cause serious illness, but they could irritate your skin.